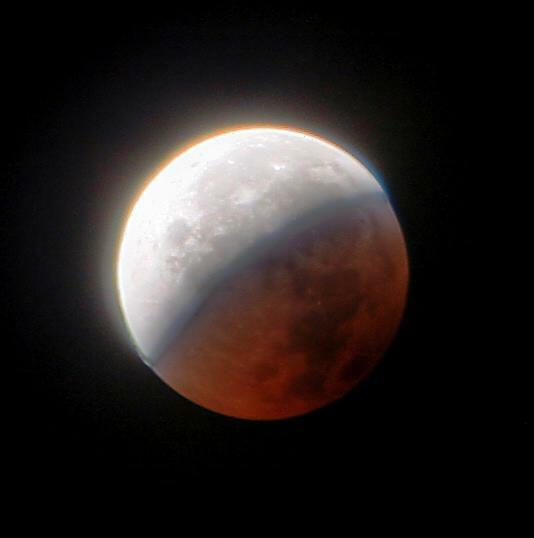 In one week and one day, we’ll experience the first of two eclipses: the Aug. 7 Aquarius Full Moon and partial lunar eclipse. That will open the door to the Aug. 21 total solar eclipse in Leo. These are the key midyear events; so you’ll want to notice whatever happens in your life this week. In one week and one day, we’ll experience the first of two eclipses: the Aug. 7 Aquarius Full Moon and partial lunar eclipse. That will open the door to the Aug. 21 total solar eclipse in Leo. These are the key midyear events; so you’ll want to notice whatever happens in your life this week, and the coinciding astrology, and use it to prepare yourself and get pointed in a direction that’s best for you. Partial lunar eclipse from 2007. Photo by Steve Ryan. Meanwhile, the symbol for the Moon at 16 Aquarius reads: “A big businessman at his desk,” with the keynote, “The ability to organize the many aspects of an enterprise involving a large group of human beings.” This pair of symbols, taken together, seem to speak of both the new space that opens up between eclipses for vibrant change and growth, and the clear need to get organized (within oneself and with others) to facilitate that. If you’ve felt a little too overcommitted, distracted or overwhelmed with self-doubt to begin getting focused on your desired trajectory, it’s possible that the inherent energy peak of the Full Moon and partial lunar eclipse might come with some tension or sense of deadlock. As that comes to a head, it could offer some useful clarity. Before we get there, on Monday, Venus enters Cancer. This brings Venus into the Moon’s home sign — a more instinctual, sensitive, emotional and perhaps even subconscious role compared to how its energy expressed in Gemini. Notice if your inner tides feel more cyclical; pay attention to how you feel about your sense of ‘security’ and about things like family. On Wednesday, Mercury makes a conjunction to the asteroid Vesta in Virgo. With both Vesta and Virgo related to service, this looks like a reminder to let your thoughts and words serve a tangible purpose — as in, a purpose beyond yourself and your own gain. How can you make your devotion manifest? It’s possible that can happen through keeping your inner creative flame lit, and expressing it to the world. Moving things along in the background is Jupiter in Libra square Pluto in Capricorn (exact Friday) — and this aspect will still be quite close during the Full Moon at the end of the week. Jupiter-Pluto is an engine: the ambition to achieve great things, especially if it involves repairing, rebuilding or restoring something. 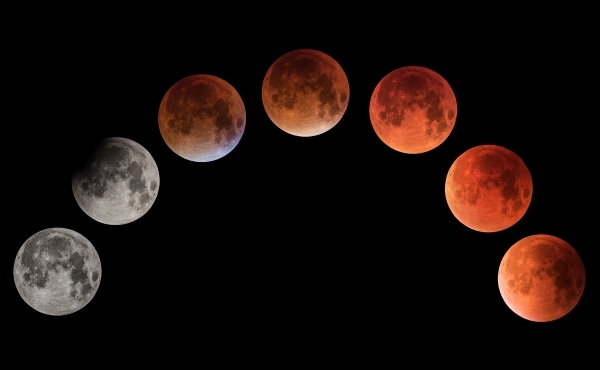 Composite image tracking the progress of a lunar eclipse in late September 2015. Photo by Dominique Dierick. Operating between cardinal signs related to relationships and justice (Libra) and institutions and structures (Capricorn), there’s a reminder here to work from the inside out. That is, if you find yourself getting a little obsessive about reforming a social group, a longstanding tradition or a relationship partner, you’re likely to meet considerable resistance. The upcoming eclipses are portals for your own quantum growth; that’s not something you can force on others, no matter how enthusiastic you are about it. Even so, when the Moon and Sun oppose each other on Aug. 7, they’ll be applying within a couple degrees or so to Jupiter and Pluto. This means the upcoming partial lunar eclipse is tapping into that background engine. Keep yours warmed up, and stay sensitive to your instincts. To shine outwardly like the Sun, it helps to get your inner facets of Self working in harmony. As this Aquarius Full Moon and partial eclipse is a South Node eclipse, it may be helpful to remember that part of any thorough organizing effort is the process of releasing what is no longer needed, to make space for what’s ready to emerge. Amanda,thank you for talking us thru this with such clarity. I now feel like I have a series of stepping stones laid out before me . What you are saying has a deep resonance with my own life ( cancer sun & rising). And it’s greater still to see that life placed within the bigger picture of what’s happening. Your remark in respect of the Jupiter-Pluto engine and reference to repairing,rebuilding, and restoring ,aligns sweetly with the promo I’m putting together for my business ‘rest,restore,recover’ . It’s been a tough few years to say the least ,so starting to sense “The surge of life and love ……” and awakening to new ways of being in the world ,that’s exciting , isn’t it ! Stepping stones! Linda Rock, what a beautiful image to articulate. Thank you. For sure, I think it’s always helpful to remember that “big” astrological events like eclipses don’t just happen out of nowhere; there’s always some kind of cycle or path we can track and trace, and even co-create or respond to with a little more intention as we go along. And yes, then there are the “surprise events,” though they don’t *really* occur in a vacuum, either. I think sometimes seeing the process as something like stepping stones can be helpful to remind us that even if we don’t feel “ready” for an astrological event and fear we might “miss it” or not make the best use of it, another opportunity to move forward in our growth and healing will appear in due time along the spiral path. There’s *always* another stepping stone.